One of the hidden gems of St Ives - the museum is tucked away on Wheal Dream between The Harbour and Porthgwidden Beach. Its packed with what I can only describe as "stuff" relating to the town, its history and residents. Its run by enthusiastic local volunteeers rather than "professionals" so its a proper old- fashioned museum not an "experience" or "educational enrichment opportunity". There are hundreds of exhibits which include paintings, stuffed animals, archaeology, old photographs, clothing, textiles, bibles, houshold items, tools, model ships and loads more. Themes include fishing, mining, The Hain Steamship Company, John Knill, railways, art, lighthouses, boat building, World War II and RNLI. 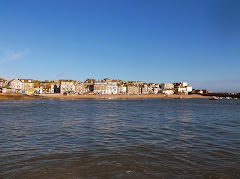 New exhibits for 2009 include a Pilchard Curing Cellar and a Video Room where you can watch films about St Ives and its history. They have prints of many of the photographs for sale, but if you want a print thats not in stock they can arrange this and send it on to you. Plans for next year include installation of a Bernard Leach section with pottery by the artist and other memorabilia. School parties and other groups are welcome but asked to book in advance. The curator and staff can arrange a tailored visit for you. Childrens workbooks are available covering various themes. Enquiries from students, researchers and others are welcome. Please write to Brian Stevens Hon. 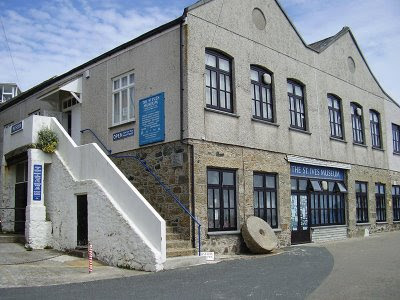 Curator, The St Ives Museum, Wheal Dream, St Ives, Cornwall, TR26 1PR. Enclose an SAE to ensure a reply. They are keen to recruit new volunteers so if you'd like to help out get in touch. 10.00 - 5.00 Monday to Friday. To find it simply walk along The Wharf or Back Road and keep going until you reach it. It is a fabulous little place - and ideal on a rainy day in ST Ives (much better than the Tate, but thats just my opinion). I loved the photos of Porthmeor beach when it was a farm!!! and the Gasworks!! how horrendous were they!! The museum on Wheal Dream in St ives used to be a garage for milk floats until the late 60s. Does anybody remember the name of the dairy?